With all the raves pouring down on Breath of the Wild, it is all too easy to ignore the biggest problem plaguing Zelda games: they can only be played on Nintendo hardware. What about those of us lacking in that department? What can those people wanting more Zelda in their life do? Related reading: Another quality Zelda clone is Oceanhorn on iOS. Matt's review here. World to the West presents a viable answer to this question. It doesn’t take more than a few seconds to realise this is a Zelda look-n-feel game (yours truly’s wife did not require more than a glimpse at the TV to draw that conclusion; one can argue against the sample size of my research there, but one cannot stand in the way of science). 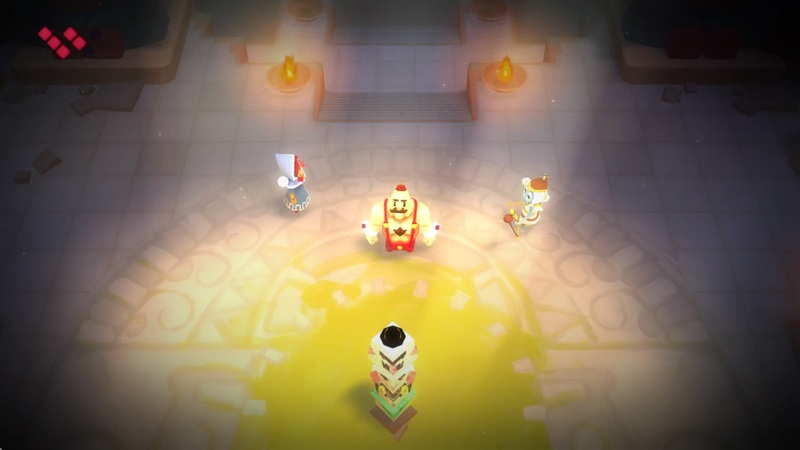 To its credit, World to the West does pack a trick up its sleeve, one that was perhaps inspired by a Zelda game yet again (Tri Force Heroes): instead of controlling one hero, World to the West lets you control four! (And that’s without counting the animals you can hypnotise into submission and take control over in the game (And before you accuse me of speciesism afflicted character counting, I will add I am a fan of Peter Singer’s work on animal rights, and I’m trying, Ringo, I’m trying real hard to reduce my personal impact on livestock (At which point I will mention the editor had already told me off for going off topic and absolutely forbade me from discussing the noble virtues of coffee in my reviews (also three separate bracketed comments in one is a bit much there - ed)))). This single player only game has you controlling your hero from an angled overhead perspective that older (better?) Zeldas have sported. Your first character is Lumina, a girl accidentally transported to an unknown location while trying to get to the father she did not say goodbye to. Lumina has electric powers, exposing us to a few… Zelda like fights with creatures she encounters, some very cute and some less so, as well some interesting platforming using her teleportation abilities. Next, we meet a small boy of a mining colony whose leader exploits his workers, motivating them to dig by telling them they are on the moon. Our little fellow knows better because he found a tree, but because folks can’t handle the truth this knowledge renders him an outcast. All the better for us players, because his special ability is his small size and a shovel with which he can dig under obstacles or enemies. That newly found perspective of special abilities allows you, the player, to solve some of the previously solved puzzles in a different way as well as discover new map areas that you couldn’t have reached before sans digging. It is this learning that is the key trick of World to the West, and it is very well implemented. At the same time, the ambiguity regarding the boy’s goals and, by extension, the game’s overall goals is laid bare: it is as if World to the West tells us right from the start to forget about making sense of things and focus on exploring its world map (by, needless to say, venturing west from the starting point). Eventually you will meet the third character, a female Indiana Jones treasure hunting adventurer whose scarf goes a long way into subduing enemies as well as working through platforms. By now you will also find yourself using what the environment has to offer as you continue your exploration quest, be it the monsters themselves or tangled vines that act as short term helicopters. Later you will even meet the fourth hero, a wrestler beefcake fellow that can crush his way through barriers and monsters as he seeks to make a name for himself and his muscles. Sure, that multi character mechanic of World to the West is cool and all, but it is not without its limitations. To start with, you can only do things with one character at a time (so no, this is not a Tri Force remake). The rest of the available characters wait out at designated locations, if they are available in the first place; for most of my play time, only one or two characters are available at any given point in time. This sacrifice the game makes in order for its core mechanic to work with the map it has to offer might not sound like much, but I have found that if the game does have a story to tell, and to one extent or another it does, then its narrative drive is certainly relegated a few leagues down. 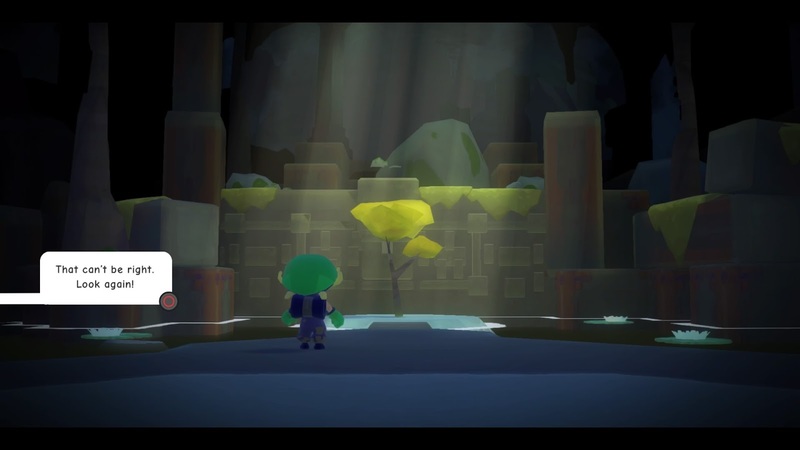 Or, to put it simply, when you play World to the West your focus will be targeted solely on the puzzle solving, and damn the narrative torpedoes (or, for that matter, caring for the characters). If we’re into the nitty gritty, I will go further and mention World to the West’s production values do not seem to be up there with the A listers. It starts at the beginning, with the main menu’s lack of a default option; it continues with black loading screens that take getting used to before realising you are not going through a blackout in real life. By far the most annoying are the finicky controls, that had me losing lives much more often than the enemies. Some of the time critical puzzles had me hitting boiling temperature when the characters chose to casually die at this slightly different angle to the one they should have clearly traipsed through instead. Matters of technical deficiencies go further. If you listen carefully, you will notice the weird sounds coming from your PS4 are yawns. I can relate to that: World to the West does not even begin to tickle the console’s abilities. To which I will add the Zelda HD remakes for the Wii U offer better looks, and even Oceanhorn on the Apple TV provides superior spectacles. Further keeping things simple are text bubble based communications, relieving World to the West of the need for any voice acting. I was never the type who counts frames and assesses the resolution of character shading. I firmly believe these are merely tools available at a developer’s disposal to create a great game with, alongside many others. 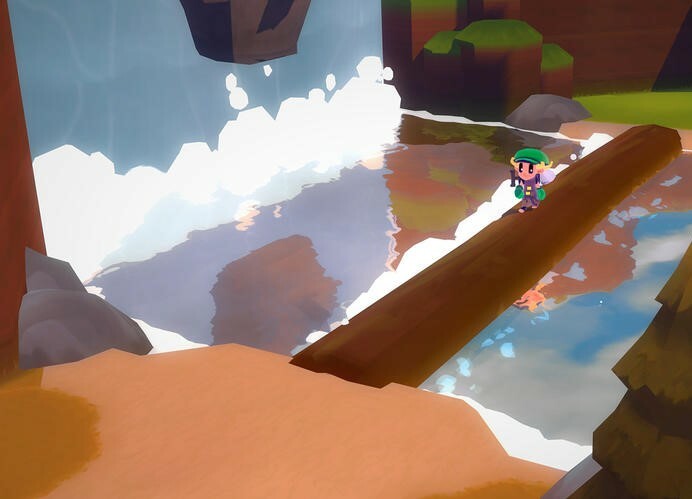 If the end goal of a game is innocent, charming, fun then I find World to the West outdoes Oceanhorn and sports a lot of the finer qualities of a game such as Wind Waker (aka The Real Thing). 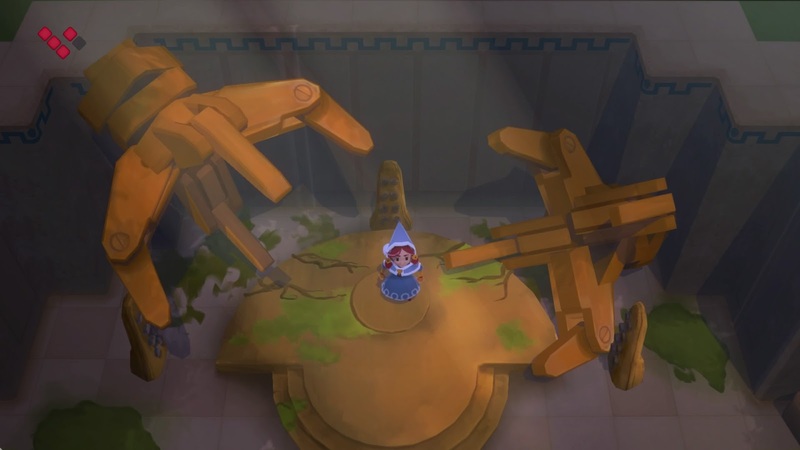 Sure, World to the West has its boss fights and the occasional platforming task that feels like a boss fight in its magnitude, but the main course served by the game is hours of ongoing puzzles that never find the player stuck beyond recourse (a feat the “real” Zelda could benefit learning from) and continuously feels fresh and original. And if it takes four different characters to achieve such a feat, as well as the sacrifice of good narrative, then so be it; the world of gaming can manage with such sacrifice given the reward. And sure, there are games around that manage to eat the cake and have it too, but there is no universal law preventing others from doing their best despite all sorts of constraints while exposing their players to some new grounds. Related reading: And for people with a Nintendo Switch, Zelda: Breath of the Wild is, of course, essential. Brad's review. For this average adult, a person with little time to spare and numerous responsibilities, World to the West proved quite an effective magnet. Despite all my commitments, I was somehow able to find the time to play it, and then clear some more time so I could play it again. I’d therefore argue many much more pretentious titles out there could learn a lesson or two about the value of humility in game design.